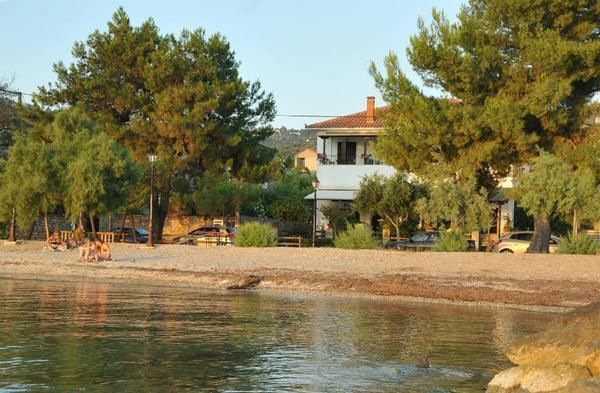 The house is located almost on the outskirts of the village Milina opposite the uninhabited island Alatas and only 30 meters from the beach, which is separated by the local road. Milina is the gateway to South and South East Pelion. From Milina you can reach eastwards Platanias and micro as well Katigiorgis and the south, you reach Trikeri, Agia Kyriaki and the small inhabited island Trikeri. A trip there is recommended. Our house is on 2 floors and has 6 units; four of them with sea view and two with mountain views. All apartments are equipped and well maintained. We take care is to our guests and we strive that nothing is missing. Beach: in front of the house sandy-pebble beach (about 30 m). Of course, in the surrounding area there are many small bays and beaches with clear water. Entertainment and shopping: Nearby and along the promenade you will find beautiful taverns, cafes, restaurants, traditional ouzo taverns and grocery stores. In Milina there are also many organic products. One can in Milina even small boats for rent. Both studios are on the ground floor and are the same size and equipped. Each studio has a loft with a double bed (about 12.5 square meters), which is accessible via a wooden staircase, the main room (about 24 50 square meters) with kitchenette (standard equipment) and dining table, a pull out sofa bed, shower / WC and a large veranda (18 sqm) with garden furniture and a fantastic sea view. Kitchenette with fridge, coffee maker, toaster, kettle etc. Almost at the end of the promontory of the Pelion peninsula is the small fishing village Milina. In this wooded area many woodcarvers were formerly held - today the idyllic atmosphere of the village attracts more and more tourists in this southern region of Pelion on the Pagasitikos Gulf. The village has taverns, cafes, shops and two boat Mooring, from where one takes visitors on excursions to the islands Alatas and Prassouda or something more remote island Trikeri. can also with a boat or brought a rented motorboat.